The recipe for my friend Leah’s mom’s delicious homemade granola! Leah’s mom, Phyllis, made me a batch of her homemade granola when I was in Chicago for my bachelorette party and I raved about it on the blog with promises that I would eventually get the recipe and post it for you guys to enjoy. Mix the liquids separately until well blended. Coat dry ingredients with liquid ingredients. Spread onto an ungreased cookie sheet or two 9×13 pans. Bake at 350 for 20 min. Then reduce to 250 and turn every 10-15 minutes until browned to suit taste. 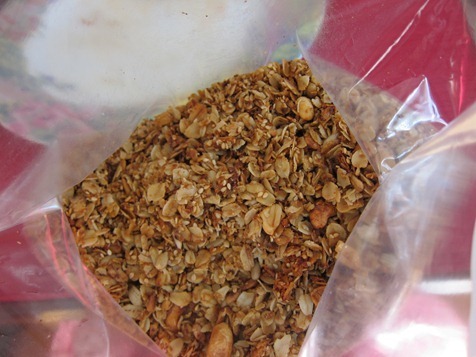 This recipe makes a lot of granola, but you can easily make half of the recipe or a quarter of it if there’s only one of you and you don’t want to swim in granola. Or you can make all of it and be like me and eat it non-stop for days because it really is that good. Anything with that much honey must be good! Sounds delish! Thanks for the recipe! I’ll have to try that myself sometime. The plan to go from house to house for your dinner was such a good bachelorette party idea! 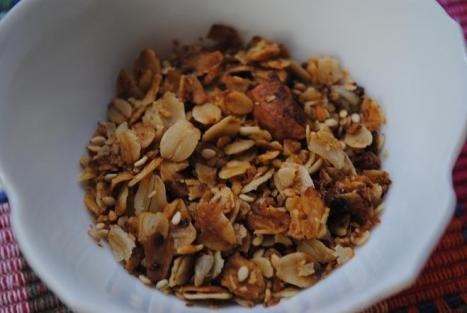 I’m always on the lookout for healthier, cheaper granola, and this looks delicious! Thanks so much for sharing the recipe. I love granola….love it! I am actually quite the granola killer so I would make the entire batch! There is never such a thing as too much granola! Yum. This sounds do good. However, I’m going to have to hold off on making it for a bit, because I made my own last night and have been eating it non-stop. I love granola! This one looks absolutely delicious!! That sounds great!! I love homemade granola. Much better than the ones in grocery stores! Thanks for the recipe…I’ve never made my own, but am definitely curious! That sounds wonderful; going to have to try this recipe! Sounds and looks great! Love the sesame seed addition. Do you know if it’s possible to put some dried fruits (cranberries, raisins) in this recipe making it more like trail mix? oh absolutely! once it’s completely cooked and cooled, you can add dried fruits, more nuts, chocolate chips… anything that strikes your fancy! I actually did the calorie math if anyone is interested….this full recipe makes 15.16 cups for a total of 12,641 calories (yikes!). That comes down to 426 calories per half cup serving and 208 calories per quarter cup serving. It looks so delicious…can’t wait to make it! WONDERFUL! thank you for calculating! i’ll edit the recipe to add this in. I am definitely making your/Phyllis’s granola this weekend. It looks so good and I can just imagine how crunchy and tasty it must be. Thanks to Meredith for calculating the calories! Sometimes I’m torn between wanting to know something’s calorie content and wanting to live in blissful ignorance! And while 426 cals per cup isn’t amazing (because I KNOW i’m going to want more than one cup!) – it can be my weekend treat! I am definitely making your/Phyllis’s granola this weekend. It looks so good and I can just imagine how crunchy and tasty it must be. Thanks to Meredith for calculating the calories! Sometimes I’m torn between wanting to know something’s calorie content and wanting to live in blissful ignorance! And while 426 cals per half cup isn’t amazing (because I KNOW i’m going to want more than one cup!) – it can be my weekend treat! Hi, my name is Paul and since Phyllis is my mother I have been eating this granola for more than twenty-five years. It is good cooked as the recipe calls for, but it is also fun to eat it raw with honey dripped on top, in yogurt mixed with jam or jelly, and in just water. If you let it soak for a couple minutes in milk, yogurt, or water I notice the nola digests better. Lastly, I just want to say that I think this blog is great, Julie is a great, and to enjoy the food. i was curious is anyone knew if i could replace the wheat germ with more oatmeal or wheat bran or oat bran since i dont have any wheat germ? ?